NightRush is a new casino, which only opened it’s doors earlier this year, and is part of the Bethard Group. With years of experience and expertise, we’d expect nothing less than a great experience. Will it fare as well as their other products? Let’s find out. 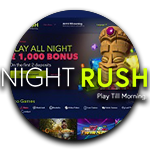 With their slogan, “Play Till Morning”, NightRush is clearly targeting players who love to play until the early, or better yet late, hours. The colours used are fitting to this theme, with mainly a dark purple in the background. A pink and bright green colour balance out the darkness and give the site a fresher look. Registering an account is a two step process. First, you’ll enter your name, username, password and some other basic information. In the next screen you will enter your address, mobile number, and get to pick your preferred language and currency. The site is offered in English (regular, CA and NZ), Finnish, German, Norwegian and Swedish. Currencies match the language options as you’re able to play in CAC, EUR, CHF, NOK, NZD and SEK. Great news for a lot of players, as nothing beats playing in your own language and currency. After filling in the necessary information you will receive an activation code via text or email. Fill that in, and voila! If you sign up for NightRush you’re in for a pretty sweet deal. After joining you can use the Welcome Bonus package which has a value of up to € 1000/ 10,000 SEK/10,000NOK. It’s divided into two deposit bonuses. On your first deposit you will receive a 100% deposit bonus up to an amount of € 500/5,000 SEK /5,000 NOK. Let’s say you deposit € 50, then you’ll receive the same amount in bonus money. On your second deposit, you’ll receive 50% bonus up to the same amount. Both bonuses will be activated when you deposit € 20/200 SEK /200NOK or more. The wagering requirement for any regular bonus at NightRush is 45 times. Whether you only want to gamble for small amounts, or go all out, NightRush provides for everyone. With a minimum deposit requirement of €10 and a limit of €100,000, it’s easy to see why the casino attracts players with all sorts of habits. Option wise, we’d say all major payment options are offered here. Most payments are processed for free, however VISA and Mastercard do have a 2.5% fee. Below you can find an overview with all available options, and their withdrawal and deposit requirements and limits. Deposited amounts will appear in your account immediately, and withdrawals will be processed by the casino within 24 hours. Should you need to verify your account, NightRush offers the possibility to upload them via your account. We always love it when casinos offer this as it can spare you a lot of back and forth communication via email. When you go to Account > Verify, you will be able to upload documents in de designated sections, where you can also read the requirements for the documents. By far the most impressive things we’ve encountered on NightRush is the extensive variety of game providers that they choose to offer games from. In total you can play over 700 different online games, so it’s safe to say you’ll definitely never get bored. 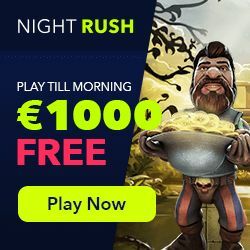 Rather than just a few selective game providers, NightRush offers games from an array of providers such as NetEnt, Microgaming, Quickspin, Evolution Gaming, ISoftBet and NYX. To provide an easy overview, the games have been divided in the following sections: Slots, Blackjack, Roulette, Video Poker and Table Games. If you already know which game you want to play, you can of course simply use the search tool, and if you have a favourite provider you can simply click on Vendor, and select your favourite from the list. The game lobby also has two other handy features. Firstly, you can add any game to your favourite list. Once added, you will be able to easily find it back by going to the “Favorite” tab. Did you recently play a game, but forgot what it’s called? Simply click on the “Last Played” tab, and you’ll find an overview there. When we created our account we had a minor issue during the registration process. There was a slight delay in receiving the verification code, which followed in us contacting NightRush’s support team. We contacted them via their live chat system, and were helped by a very pleasant and rather funny agent. Whilst in the chat, we did receive the activation code via text. Big thumbs up for the support team though. As far as we could see there’s no phone support, however they do offer live support via chat, and you can fill in a contact form via their contact page. During our test we must say we had a very pleasant experience with NightRush. A+ for design, usability and customer friendliness!